The Bangkok skytrain and subway provide a combined coverage of 40 km of mass rapid transit tracks, that's integrated with other forms of land and water transport, for fast and convenient travel within the city. 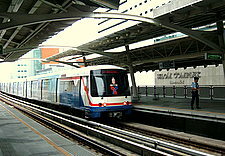 The Bangkok Mass Transit System Private Company Limited manages the Bangkok skytrain or BTS, which started on 05 December 1999. The skytrain runs above ground all the way. 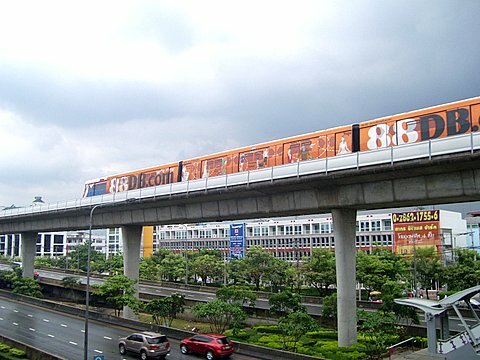 The Bangkok Metro Private Company Limited manages the Bangkok subway or the MRT, which started in June 2003. The entire line is underground. Both services operate daily from 0600 hours - midnight. For travel for the disabled, please see Bangkok skytrain and subway facilities for the disabled. The Sukhumvit line starts from Mor Chit in the north and ends to the east in Sukhumvit Road at Samrong, a total of 23 stations. N8 Mor Chit, N7 Saphan Kwai, N5 Ari, N4 Sanam Pao, N3 Victory Monument, N2 Phaya Thai,, N1 Ratchathewi, Siam interchange E1 Chit Lom, E2 Ploenchit, E3 Nana, E4 Asoke, E5 Phrom Phong, E6 Thong Lor, E7 Ekamai, E8 Phra Kanong, E9 On Nut, E10 Bang Chak, E11 Punnawithi, E12 Udom Suk, E13 Bang Na, E14 Bearing and E15 Samrong. The Silom line starts from the National Stadium in the west and ends at the Wong Wian Yai in Thonburi, a total of 13 stations. W1 National Stadium, Siam interchange, S1 Ratchadamri, S2 Sala Daeng, S3 Chong Nonsi, S5 Surasak, S6 Saphan Taksin, S7 Krung Thonburi, S8 Wong Wian Yai, S9 Pho Nimit, S10 Talat Phlu, S11 Wutthakat and S12 Bang Wa. Stations in bold italics are interchange stations. At Siam, commuters can switch between the Silom and Sukhumvit lines. The other interchange stations are between the Bangkok skytrain and the subway. Please see Bangkok skytrain for details and the BTS system map. At N2 Phaya Thai skytrain station, commuters can connect to the Suvarnabhumi Airport Link which goes all the way to Suvarnabhumi Airport. At Petchaburi (PET) subway station, commuters can connect to the Suvarnabhumi Airport Link to go to the airport. 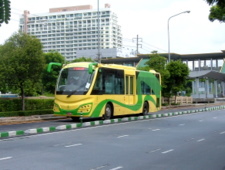 The Bangkok BRT a Bus Rapid Transit service started its first line linking Sathorn to Ratchaphruek with an interchange at Sathorn connecting to the Silom line at S3 Chong Nonsi station. 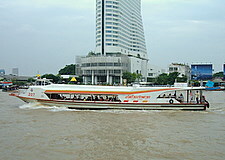 The Bangkok skytrain also provides additional services for tourists and commuters in general. Three Tourist Information Centres are at Siam, Nana and Taksin Bridge stations operating from 0800 – 2000 hours everyday. These centers provide free Bangkok skytrain and subway maps, sell Chao Phraya tourist boat tickets, tour books for a skytrain tour of Bangkok and provide an internet service. 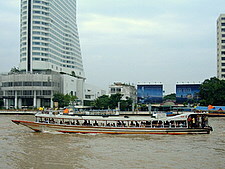 At the Sathon Central Pier, just below the Taksin Bridge station, visitors can take the Chao Phraya River tourist boats or the regular Chao Phraya River boats. Free shuttle bus services are also available everyday at selected skytrain stations. The locations relevant to visitors are along the tourist stretch of Ploenchit and Sukhumvit Roads. Bus coupons are available on request when you buy single trip and stored value tickets. For details on skytrain stations, Bangkok hotels near the skytrain, shopping malls, historical attractions and tourist services, please see Bangkok skytrain. The Bangkok subway starts from Bang Sue to the north of the city and ends at Hua Lamphong near Chinatown, in the heart of Bangkok. The route has a total of 18 stations covering a distance of 22 km. 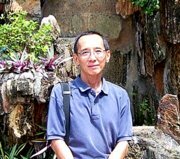 Bang Sue, Kamphaeng Phet, Chatuchak, Phahon Yothin, Lat Phrao, Ratchadapisek, Sutthisan, Huai Kwang, Thailand Cultural Centre, Phra Rama 9, Petchaburi, Sukhumvit, Queen Sirikit National Convention Centre, Khlong Toei, Lumphini, Silom, Sam Yan, Hua Lamphong. Interchange stations between the subway and skytrain are in bold italics. For details on subway stations, Bangkok hotels near the subway, shopping malls, historical attractions and tourist services, please see Bangkok subway and the MRT system map. There are three interchanges between the skytrain and subway. 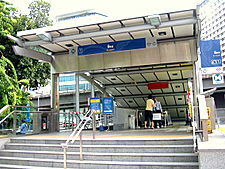 Mor Chit skytrain station – Chatuchak subway station in the north near the Chatuchak weekend market and Chatuchak Park. Asoke skytrain station – Sukhumvit subway station at the junction of Sukhumvit Road and Soi Asoke. 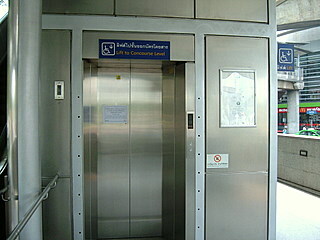 Sala Daeng skytrain station – Silom subway station near the junction of Silom and Rama IV Roads. 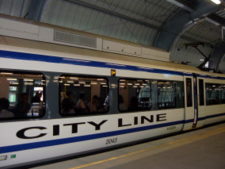 Unfortunately, the two services use separate ticketing systems, so commuters have to buy another ticket when they switch from the skytrain to the subway and vice versa. Commuters can buy single trip tickets or one-day passes for unlimited trips for the day at 100 baht for the skytrain and 120 baht for the subway. Three-day tourist passes are 280 baht for the skytrain and 300 baht for the subway. Frequent visitors can buy stored value cards at 200 baht with a minimum renewal of 100 baht. Validity is 2 years for the skytrain card and 5 years for the subway card. The Bangkok skytrain and subway services provide a fast and convenient means of transport that's integrated with other forms of land and water transport. Have a safe and happy trip touring Bangkok legacies.